(AP) Oil fell below $86 a barrel Friday as concerns over the global economy dominated trading. Weak U.S. employment figures added to those concerns, a day after Europe and China cut interest rates in response to deteriorating economic data. U.S. employers added just 80,000 jobs in June, a third straight month of weak hiring that shows the economy is still struggling. The unemployment rate was unchanged at 8.2 percent, the Labor Department said. The U.S. economy has added just 75,000 jobs a month in the April-June quarter, compared with 226,000 a month in the first quarter. Jobs report: Are we there yet? By early afternoon in Europe, benchmark oil for August delivery was down $1.53 at $85.69 a barrel in electronic trading on the New York Mercantile Exchange. 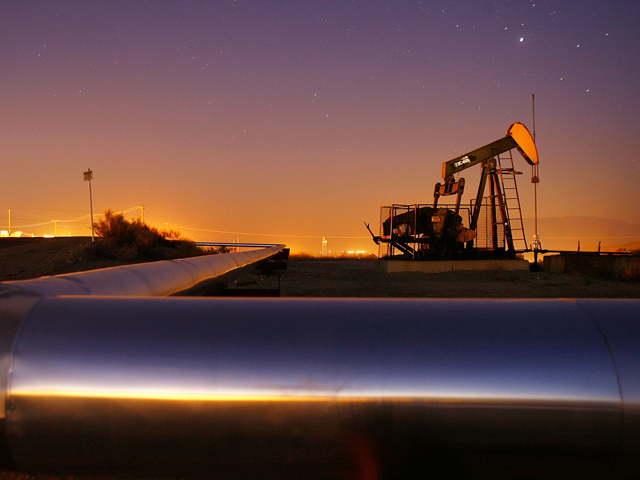 Crude fell 44 cents to settle at $87.22 on Thursday in New York. In London, Brent crude for August delivery was down $1.83 at $99.17 per barrel on the ICE Futures exchange. On Thursday, central bankers in Europe and China cut lending rates while the Bank of England pledged to boost money in circulation in a bid to spur weakening economic growth. Some analysts said the moves weren't sufficiently drastic to spark growth while others expect more stimulus measures soon as the global economy deteriorates. The concerns over the global economy have boosted the dollar against the euro and pushed down oil prices by making crude more expensive and a less attractive investment for non-dollar traders. The euro was down at $1.2378 from $1.2388 on Thursday in New York. A week ago, the euro was trading at $1.2663. "The fall ... is starting to be problematic for the recovery of oil prices," said Olivier Jakob of Petromatrix in Switzerland. Crude has plummeted from $106 two months ago as Europe's economic and political turmoil dampens global growth expectations. "We still believe that disappointing economic data going forward, while suggesting curtailed oil demand, will also increase the likelihood of some form of stimulus capable of reviving oil's appeal," energy trader and consultant Ritterbusch and Associates said in a report. Also weighing on prices, especially on Brent, were expectations that the Norwegian government would force striking oil workers back on the job after they failed to reach an agreement with employers. The workers are now being locked out and analysts now think the government will have to get involved to end the strike. "It is not therefore surprising that the price increase has not been sustained," analysts at Commerzbank in Frankfurt said. Investors also brushed off a larger than expected drop in U.S. crude supplies, which suggested demand may be improving. The Energy Department's Energy Information Administration said Thursday that crude inventories fell 4.3 million barrels last week while analysts surveyed by Platts, the energy information arm of McGraw-Hill Cos., had predicted a decrease of 2 million barrels. Heating oil was down 3.98 cents at $2.7286 per gallon and gasoline futures slid 3.42 cents to $2.7306 per gallon. Natural gas gained 2.5 cents to $2.970 per 1,000 cubic feet.